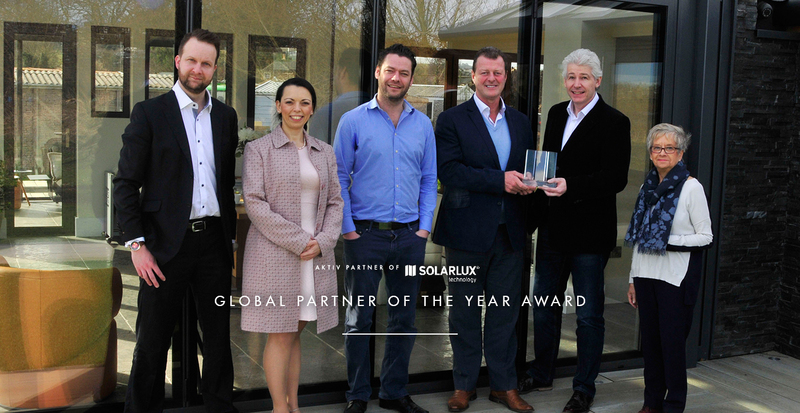 Harewood, Thursday March 3rd 2016 : Yorkshire businessman Mark Caulfield being presented with the Global Solarlux Aktiv Partner of The Year Award by Mark Phillips, Sales Director of Solarlux. This recognizes Mark as the world’s top performing distributor of these high tech window and door systems, used by leading architects such Sir Norman Foster. The award also underlines the exceptional growth of The Caulfield Company over the past five years since it became a top level ‘Aktiv’ partner for the German-based Solarlux (solarlux.com). Its success with Solarlux products has already led to the creation of 15 new jobs in Yorkshire and it is still recruiting. The Caulfield Company has two showrooms in Harrogate, one showing glass buildings, control systems and contemporary furniture and a second showing revolutionary Internorm window and door systems. A third showroom will open in Wilmslow, Cheshire later in 2016.